There’s nothing quite like the thrill of reeling one in. Sun-shining, cool breeze on your face, the excitement of feeling the line tug, and the delicate art of reeling in your prize. Whether it’s trout or bass, or if you’re like me, a teeny tiny sunfish (if you’re lucky), fishing is more than just a pastime. It’s spending quality time with family and friends, getting away from our ever present devices, and connecting with nature. Whether you’re a rookie or a coach, you need a spot to cast your line, a dock to stand on or a boat to launch. Or maybe fishing isn’t your thing, and you’d rather enjoy your local pond, lake, or saltwater via kayak, canoe, motorboat, or even a sailboat or yacht. It’s National Fish and Boating week, seven days filled with free fishing days – where you can fish without a license – kid’s fishing derbies, and how-to demonstrations. Perhaps you’re new to it all and just wondering where to get started. Fortunately, finding a spot to do so will be the least of your worries. Across the region, public access to recreational boating and fishing is increasing. Thanks to efforts by the Service, state wildlife agencies and other partners, more boat ramps, fishing platforms, trails, and other outdoor recreation opportunities are cropping up. There are over 1,600 boat ramps throughout the northeast region and each year, between 5 and 10 new boating and fishing access areas are constructed. These projects are funded and maintained through Wildlife and Sportfish Restoration Program, the granting arm of the U.S. Fish and Wildlife Service. Though grants like the Sportfish Restoration Act, Clean Vessel Act, and the Boating Infrastructure Program might sound technical, but they are important tools that allow state agencies to provide fishing and boating access to the public. The program is funded by fishing manufacturers, along with boaters, and sportsmen and women, through taxes on the sale of fishing tackle and boat fuels. However, its benefits reach far beyond the the boating and fishing communities. In its 75 year partnership with state and local agencies, this program has contributed more than $14 billion for fish and wildlife conservation and public access to the lands and waters that support fish and wildlife, making it the most successful conservation program in U.S. history. And it doesn’t end there. In addition to fishing and boating access, Sport Fish Restoration funds are used to conduct fish research, reintroduce declining sport fish species, restore wildlife habitat, and provide education about aquatic resources. If this all sounds awesome, but you’re still wondering where and how to get started, you’re reading this at just the right time. Visit us at https://www.fws.gov/fishing/ for everything you need to know before you start your adventure. This entry was posted in Blog entries, Fisheries, Habitat restoration, National wildlife refuges, Outdoor recreation and tagged boating, Boating Infrastructure Grant, Clean Vessel Act, fishing, National Fishing and Boating Week, outdoor recreation, Sportfish Restoration Act on June 7, 2018 by arielkallenbachFWS. Today we discuss diversity in hunting with Eric Morris, an avid hunter, fisherman, and all-around outdoorsman. His passion inspired him to found the Black Wolf Hunting Club in 2011, with the mission to promote the sport of hunting in the African American community, and to increase representation of African Americans in the outdoors. Eric’s goal is to close the gap between communities and access through education, written media projects, and hands-on hunting, shooting, and other outdoor experiences. In addition to founding the Black Wolf Hunting Club, Eric has travelled the country to speak about diversity in hunting, met with the National Shooting Sports Foundation to discuss the topic, taken entire families on guided hunts, served as a hunting mentor, and is currently writing a book on the subject. Q: Did you grow up in an urban or rural setting? Was hunting a popular sport in your community? A: I grew up in a town of 17,000 people, and like many places in Alabama, hunting was naturally a part of my community. Q: Did you grow up hunting or fishing? If so, who did you hunt with? A: Growing up, I participated in fishing more than hunting. When I did hunt, it was small game in my backyard and in the surrounding neighborhood. Several of my uncles and cousins hunted, and though my Daddy was not a hunter, he did purchase a .22 rifle and took me squirrel hunting when I was 12 years old. I became fascinated by stories of Native Americans being in nature and matching their skills against wildlife. I loved the idea of being able to hunt and survive off the land. Q: What initially inspired you to pursue the sport of hunting? A: I believe that some hunters, myself included, are born with an interest in the outdoors, which leads to an interest in hunting. While in elementary school, I became fascinated by stories of Native Americans being in nature and matching their skills against wildlife. I loved the idea of being able to hunt and survive off the land. I learned my great-grandmother was part Creek Indian, and I was even further intrigued. Q: Where did you primarily hunt? Did you have access to public lands where you grew up? A: Though I had access to public lands, Daddy grew up in the 1950’s and 60’s, where racism and stereotypes were prevalent, so as an African American, he was somewhat uncomfortable hunting on public lands. I primarily hunted in my backyard, wooded areas in my neighborhood, and on my uncle’s 40 acres of land since the age of 12 until I graduated college. Q: Where do you hunt now that you live in Atlanta? How is your access to local hunting sites? A: Now that I live just outside of Atlanta, I hunt all over the United States. To date, I have hunted in 10 different states, including Alaska. Locally, there are roughly 15 public hunting areas consisting of more than 140,000 acres within a two hour drive from Atlanta. Despite the availability of local areas to hunt, if a person never takes time to learn of these hunting areas, they can say “I don’t know where to go” as the reason why they do not hunt. Life has shown me that the love and passion for hunting trumps all social and racial differences. Q: Based on your personal experience, why do you think the sport of hunting is not more diverse? A: From my personal experiences, there are four reasons why hunting is not a diverse activity. The first reason is that America has a long history of excluding Blacks and other minorities from the hunting scene, and even today the perceived message in those communities is that hunting is an activity that only White people do. While this may not be the intended message, many minorities feel that hunting is a White-only sport. The second reason hunting is not more diverse is because many minorities do not feel welcomed in some hunting groups, since the faces and culture of these groups do not reflect them. Additionally, most hunting advertisements do not show diversity. The third reason, and perhaps the most significant, is “mentality.” What a person thinks about hunting, whether or not they grew up with hunters, their self-image, where they see themselves in the food chain, and internal fears all play a part in an individual’s mentality. Despite the adversity surrounding hunting, life has shown me that the love and passion for hunting trumps all social and racial differences. When two hunters meet and share their experiences, it can seem as if they are new best friends. Lastly, from my involvement in several conservation groups, I have noticed that White hunters seem to have a greater sense of responsibility than Black hunters for leaving an outdoor legacy, protecting the environment, and continuing the family tradition of hunting for their children and future generations. I have yet to see this level of involvement from the minority hunting community as minority participation in conservation groups is almost non-existent. Social and racial issues going on within our society also contribute to the lack of hunting diversity. Q: In your opinion, what do you think are the main obstacles for people living in urban communities to engage in hunting? A: I believe that people who live in urban areas, where there is the largest concentration of minorities, have a different outlook and mentality about hunting, and see hunting as a rural or backwoods activity. Urban and rural communities also dress differently, think differently, have different interests, and have a different view of guns. Another significant obstacle is introduction to the sport of hunting. For many, their families do not hunt, and no one has ever introduced them to hunting. Those who are interested in hunting may be suspicious or untrusting of those who want to introduce them to the sport. The time has come to stop just talking about diversity, and shift into taking action on increasing diversity in hunting. Q: Is there anything else you’d like to share about hunting? A: Many companies and organizations within the hunting industry realize the financial gain from tapping into the minority market. In 2016 alone, hunting expenditures amounted to $25.6 billion, and $36.3 billion in 2011. However, the reasons and motivations for wanting to diversify hunting should be genuine and sincere, and come from a place of passion for diversity rather than money. 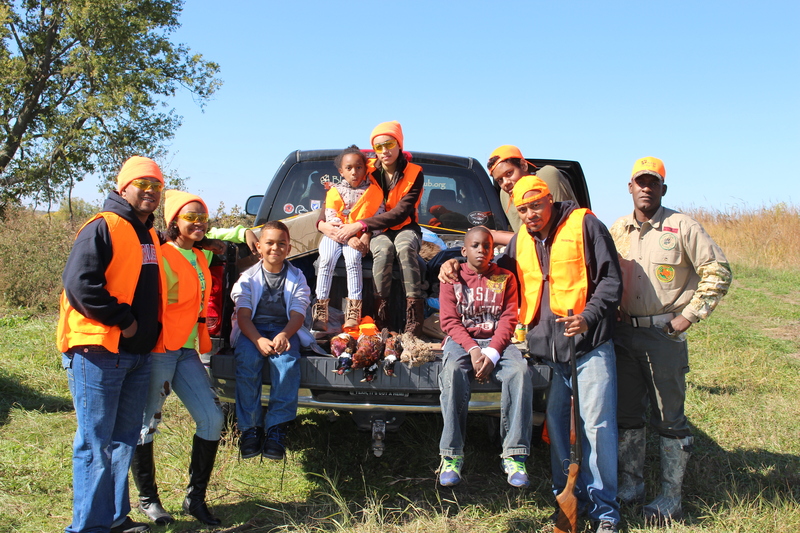 The task of increasing diversity in the sport of hunting is not an easy one, nor can it be solved by a large sum of money; it is going to take a concentrated effort, led by experienced Black or Hispanic hunters, to get other minorities involved in hunting. The time has come to stop just talking about diversity, and shift into taking action on increasing diversity in hunting. Hunting is a fun activity that offers a sense of freedom and self-reliance that cannot be matched. It is sad that hunting is not as important in American culture today compared to 100 years ago. This may be because the American landscape has changed and so have societal views on hunting. In my opinion, Americans have become increasingly more reliant on convenience and technology rather than self-sufficiency and self-sustenance. Q: In your opinion, how can public land agencies provide increased opportunities for hunters, regardless of where they live? A: With well over 100 million acres of public hunting land available to the public, finding a place to hunt is not an issue. I think that public land management agencies should first identify their target audience, then sincerely and deliberately gear their efforts towards that audience. In regards to outdoor diversity, public land agencies should invest time and resources into targeting minority markets by having outdoor days on public lands, having introduction to hunting days, offering a free hunting day, or offering select permits to hunt on public lands that would otherwise be off limits. In addition, having strong representatives from the minority community to spearhead the effort is a great way to showcase opportunities on public lands. Stay tuned over the next few weeks as we continue this conversation with Eric! This entry was posted in Blog entries, National wildlife refuges, Outdoor recreation and tagged accessible recreation, Blog, diversity, education, hunter education, hunters, hunting, hunting and conservation, national shooting sports foundation, outdoor recreation, public access, public land, urban hunting, urban initiative, urban refuge, wildlife, youth education, youth hunters on September 29, 2017 by Kelsey Mackey.